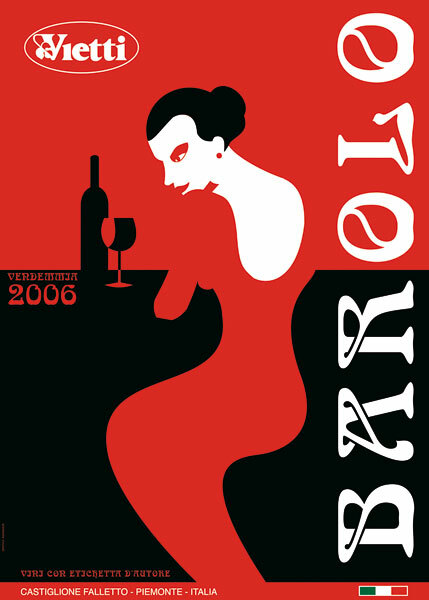 The Vietti family has always nourished a great passion for art; a passion which so far has been expressed through the creation of labels for their wines. 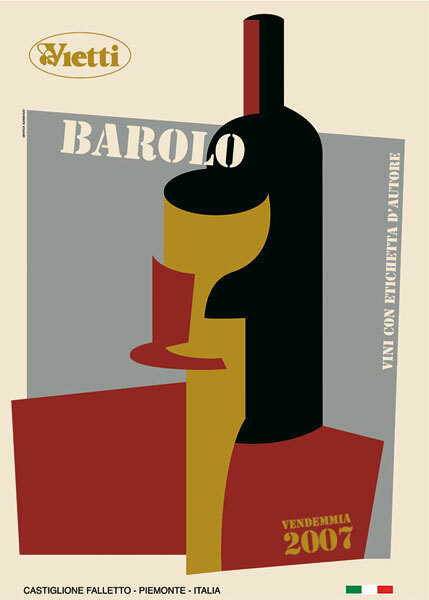 Since 1970, a series of “Wines with Designer Labels” has also been produced, and in the last six editions this has been dedicated entirely to the Villero Riserva Barolo. Over the years we have been offered works by artists of international standing, including Claudio Bonichi, Pietro Cascella, Mino Maccari, Pier Paolo Pisolini, Gioexe De Micheli, Eso Peluzzi, Gianni Gallo, Valerio Miroglio, Pierflavio Gallina, Janet Fish, Robert Cuttingham and Wayne Thiebaud. A new idea this year has led to our setting out on a project which will last another six years, and will see the realization of seven graphic works representing the most important artistic trends of the 1900sNo longer simply labels for the bottles. Something on an entirely different scale which celebrates the most important event of the year for us: the Vintage. Graphic art has always combined well with industrial production and craftwork, and from the late 19th century on it favoured the appearance of very fine publicity posters which today are considered by many collectors to be rare jewels. This particular, fascinating artistic-publicity tool reached its peak in the 1950s and ‘60s. 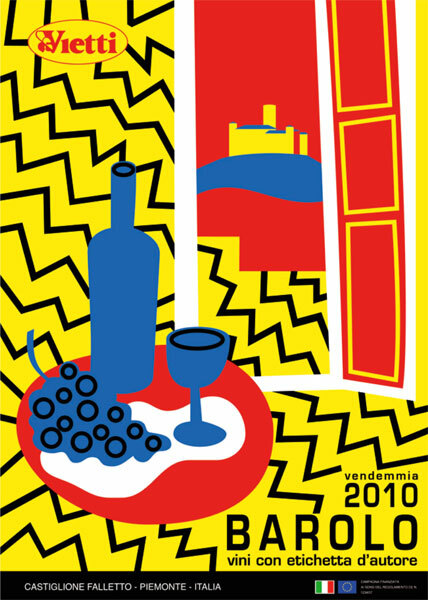 Since the birth of Pop Art, in fact, artists have increasingly used a visual language which has been filtered and assimilated by mass media languages – i.e. from the world of more immediate everyday communication. 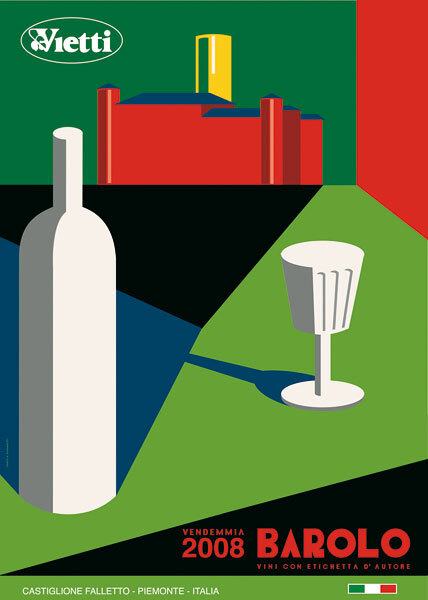 number of Italian artists have also been fascinated by this promotional artistic product, and have put themselves to the test with mass imagery, the irony of Neo-Dadaism, and the elegance of figurative silhouettes. Sadly, the rapid changes in promotional publicity media that have taken place over the last few years, with the ever-growing influence of the Net and television, have led to this very elegant artistic tradition (first-and-foremost, after all, it is bona fide art) falling into disuse. 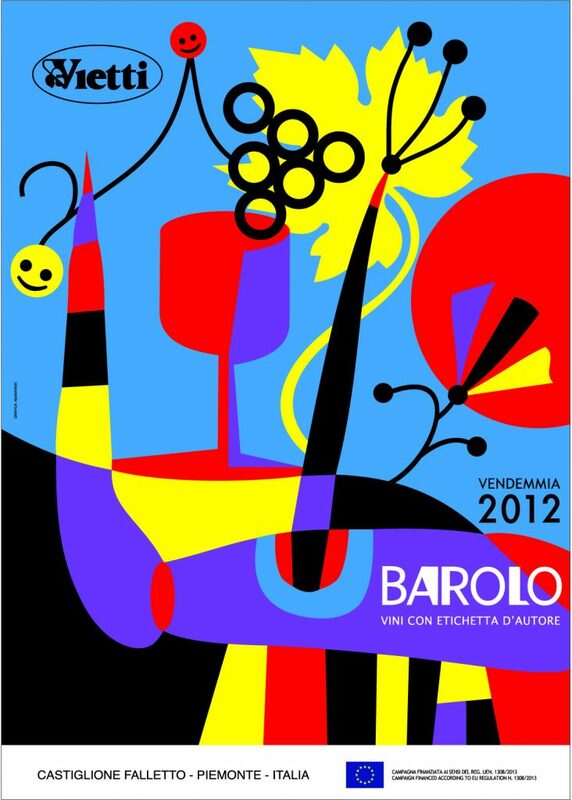 For this reason, the Vietti family has decided, through an exclusive “Vendemmia Poster Collection” produced with the prestigious co-operation of the noted Alba artist, Bruno Sacchetto, to highlightthe most significant moments in the history of 20th century art, which is also the history of our country. 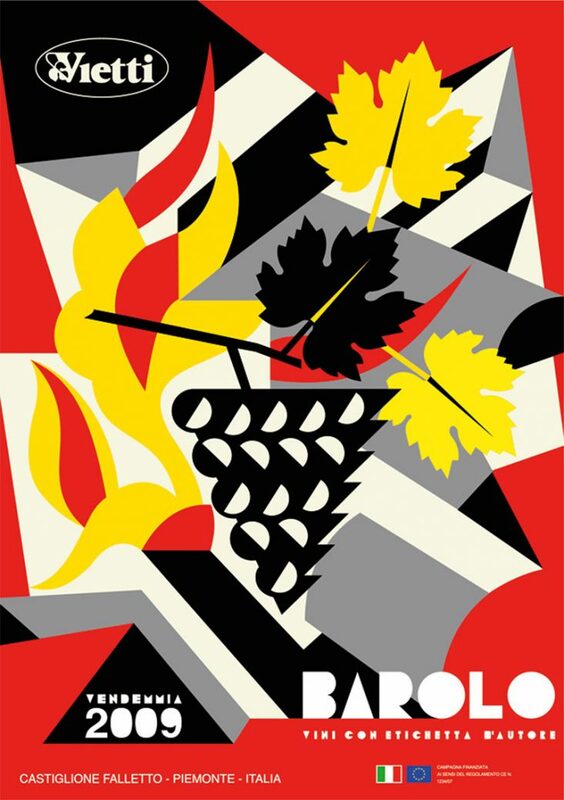 By pairing these works with the Vietti vintages we will be seeking to restore an illustrious graphic tradition, and to help to make the younger generations who did not live these times aware of an important part of our social, as well as artistic history. 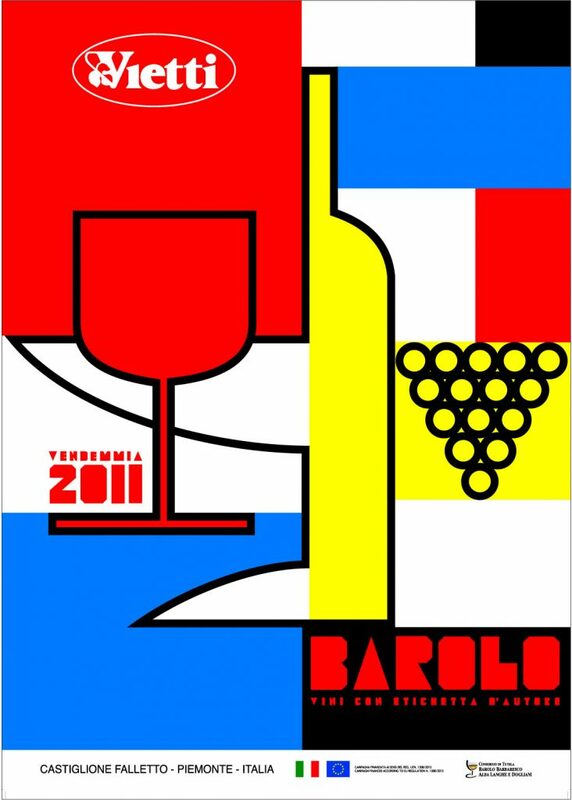 For seven vintages starting from this year therefore, we will be producing a poster in two versions: one sized 50 x 70, and another, more prestigious 95 x 133 format limited edition for 250 selected recipients throughout the world.